When I was growing up, we told people that our phone number was "MElrose 2-6755." That meant ME2-6755. Today that phone number would be 632-6755. So, BUtterfield 8 would be a 288 prefix. So before I hit the OMG MUST ORDER NOW button over at SAE, is there a second one coming from FSM or is that it for now? .....15 years ago, I dared only DREAM that we'd one day get the complete "Mutiny on the Bounty." I certainly go along here with Ron P.
As I looked at this list of scores (ordered immediately, of course), I was trying to think of the first album/score of Kaper material I EVER bought. I think it must have been the 10" MGM soundtrack lp of Kaper's songs and ballet from LILI, combined with the non-Kaper song score for EVERYTHING I HAVE IS YOURS, one score to each side. That must have been in 1953. And I think it was the first extended Kaper material ever (forgetting the 78 sets of THE CHOCOLATE SOLDIER and POLONAISE.) Next in line must have been THE SWAN, followed by AUNTIE MAME, and then, probably, MUTINY ON THE BOUNTY, with THE WAY WEST and LORD JIM coming later. Were there any more in that period? I have been so thrilled over the years to have things like QUENTIN DURWARD, LILI, THE SWAN, FOREVER DARLING, MUTINY ON THE BOUNTY, and particularly the very special GREEN MANSIONS and THE GLASS SLIPPER from Lukas---all sounding superb---and complete. What wonderful things for me to have had access to so late in my life after wishing for them for nearly 50 years! We all knew, of course, that something more was coming from Kaper, since Lukas was working on BUtterfield-8 last year at the time of our FSM Meeting, but THIS release is a real surprise containing as it does, such other rarities as ADA and TWO LOVES. On a note not meant to be negative, but forward-looking, I'd like to hope that, in addition to Lukas' focussing on the 1950s-60s period of Kaper for future releases---which we'll all buy (at least those of us who love Golden Age material)---he'll also go back into the vast treasure trove of 1930s-40s MGM/Kaper material of all genres, from noir to boudoir, for more sets like this. The Stothart 1940 NORTHWEST PASSAGE score on the westerns box set proves that old material can sound amazingly good technically when Lukas handles it---and it has led to fabulous discoveries when we hear it divorced from the sound effects and dialog of the original film. This limited 1200-copy edition of the set is a great idea, and one I've been promoting for this "special" less-well-known kind of material for a long time. I hope Lukas continues with this business plan---and I hope I always see the announcements in time and never miss out! A while back I was listening to a tape of one David Raksin's 1970s radio interviews with various film composers---this one with Kaper. Kaper seemed like a charming man, generally self-effacing, and honest about his decades of work in the industry. I imagine that he'd be pretty surprised and delighted by his sudden resurrection in the film score world these days. I wonder if anyone has ever thought of assembling a CD of the "songs" of Bronislau Kaper---from "San Francisco" to "Hi-Lili, Hi-Lo" to "On Green Dolphin Street" and points beyond. Film music collectors usually tend to forget that Kaper was also one of the most successful film-composer/song-writers working in the business alongside Dimitri Tiomkin, Victor Young, Alfred Newman, Herbert Stothart and Andre Previn. Thank you Lukas for this fabulous set. Although yesterday was YOUR birthday, you managed to give US a gift instead!!! The main title theme for "The Power and the Prize" was recycled for the 1960 original unaired pilot of "Dr. Kildare." Of all the composers working at MGM, Kaper was one of my favorites. Thank God FSM issued "Mutiny on the Bounty." This is another CD set I must have. Thanks Lukas! I am certain you mean original recordings of these songs....but I would be remiss for not pointing out that we do have some instrumentals of these themes on the "Auntie Mame" CD, plus there was a CD of Kaper performing his own major songs/themes on piano. Oh, my, all this source and dance music is just making me squirm with anticipation! And another version of "Don't Blame Me" to add to the one from THE BAD AND THE BEAUTIFUL. Wow! Whoa! Hey! Check out the covers! They didn't use the photos I predicted but instead went with some sultry re-do's of Elizabeth Taylor. Zowie! Did the FSM art guy do these or are they vintage? If I ever get Ms. Taylor's autograph, it would have to be on these pictures. Yep, that was back when La Liz was a stunner! She sure was. A true babe! The joke going around after she lost her looks was "Every woman wants to look like Liz Taylor. Now the do." Yum! Definitely will be getting this set. I've always like Kaper's scores. 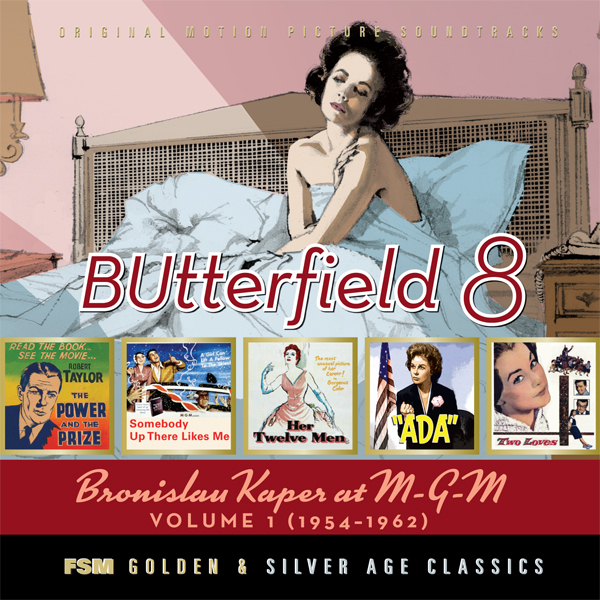 Especially excited about Butterfield 8! Agreed, very late 50's and early 60's are when I consider Taylor at her most stunning as well. She actually kept her looks a good while, she just started gaining weight, especially in her legs. The gild was off the lilly after a time. "Originals" of the songs, yes---and we do have the various theme recordings, of course---but I was talking more of the songs which were NOT based on underscore themes---like "San Francisco", "I Know, I Know, I Know" (from THAT MIDNIGHT KISS, which Mario Lanza had a big recording hit with in 1949), "While My Lady Sleeps" and others (from THE CHOCOLATE SOLDIER), "Cosi-Cosa" (from the Marx Bros' A DAY AT THE RACES), "Swing Mr. Mendelssohn" and "Down on Melody Farm" from Judy Garland's EVERYBODY SING, etc. Some years ago, the widow (daughter?) of Kaper's songwriting partner, Walter Jurmann, oversaw a German CD of material devoted to Jurmann, including things Jurmann had written with Kaper. Among them were the first "Love Song of Tahiti'", which was utilized in Stothart's 1935 score for MUTINY ON THE BOUNTY (see note below), and, very curiously, a performance of and reference to the theme we know as "Invitation" as having been originally written as a song---by Kaper AND Jurmann---for an (unproduced?) Broadway show around 1946---some years before its presumed first appearance in the score for A LIFE OF HER OWN (in 1950). We know "Invitation" as having been written by Kaper ONLY, but this CD introduced Walter Jurmann's name into the attribution. Interesting. Note: This Jurmann CD referenced above is a bit confused because, though it talks about the "Love Song of Tahiti" used in the 1935 MUTINY ON THE BOUNTY, as written by Kaper and Jurmann, it has actually recorded the love theme from the 1962 MUTINY ON THE BOUNTY, "Follow Me", in which Jurmann had, so far as we know, no contribution at all! Very odd for a tribute CD devoted to the work of Jurmann. Someone pulled the wrong sheet music to record, perhaps! But the CD is nicely recorded with full orchestra, includes some rare early Kaper/Jurmann from their pre-MGM days, and is worth picking up if you can find it anymore. I often thought Elizabeth was the most breathtaking (and virginal) in a six-year period from 1948's....A DATE WITH JUDY....to 1954's.....THE LAST TIME I SAW PARIS.....with stops for LITTLE WOMEN, A PLACE IN THE SUN, FATHER OF THE BRIDE, THE GIRL WHO HAD EVERYTHING, IVANHOE, ELEPHANT WALK, RHAPSODY, and BEAU BRUMMELL, in between..... Perhaps it was MGM's old-time glamor machine still working at its tip-top best. It always struck me that she was already getting a little world-weary---and husband-weary---by the time of GIANT in 1956, although she certainly maintained a sure kind of movie beauty beyond that with good cameramen. She takes your breath away in A PLACE IN THE SUN- That close-up with Clift. She was female perfection. .....that's me byword.....me twinkle-in-the-eye word, you know. I think Liz's finest hour with respect to looks was CAT ON A HOT TIN ROOF. She's incredibly gorgeous in that film. You can't take your eyes off of her. Perhaps, as Manderley suggests, she had great cameramen.